The Blue Shores is the second of the new buildings included in The Promenade layout for BrickWorld. While the layout overall was inspired by New York architecture, the Sand Blue and White in this building reminds me of the sea. Hence the name – Blue Shores. Hugo Santos took his inspiration for the Boavistas House from the beautiful old buildings in Oporto, Portugal. It immediately caught my eye because of its bold pink and grey facade, which is one of my favourite colour combinations. I must admit that there being two studs’ worth of pink bricks on the left but just one of pink bricks on the right bugs me (I need symmetry! ); however, the features that I noticed first were the brick-built door, the little basement arches, the window combinations and the shape of the roof. This is one of those buildings that I think would look great as a row of townhouses. Head to the Flickr album for more images of Hugos’ Boavistas House! Entries are now closed for the first ever “Complete the Room Contest“! We will hopefully be able to complete the judging over the coming weekend, with the winners announced shortly thereafter. In the meantime, you can check out all the great entries here! 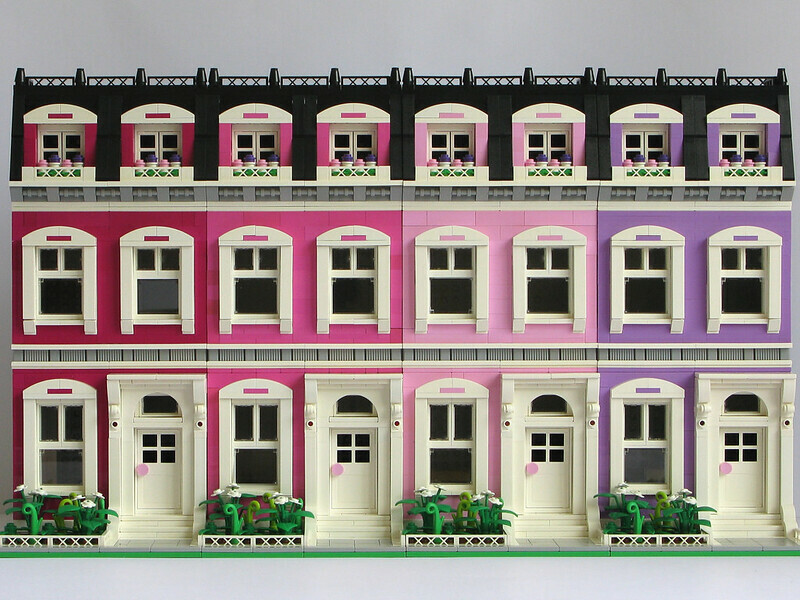 A row of townhouses in colours that are good enough to eat! See the Flickr album for a few different angles. Instructions available to download! My words won’t do this building justice, so I’m just going to leave you to drool over all the details of The Bear’s British Victorian Terrace House. 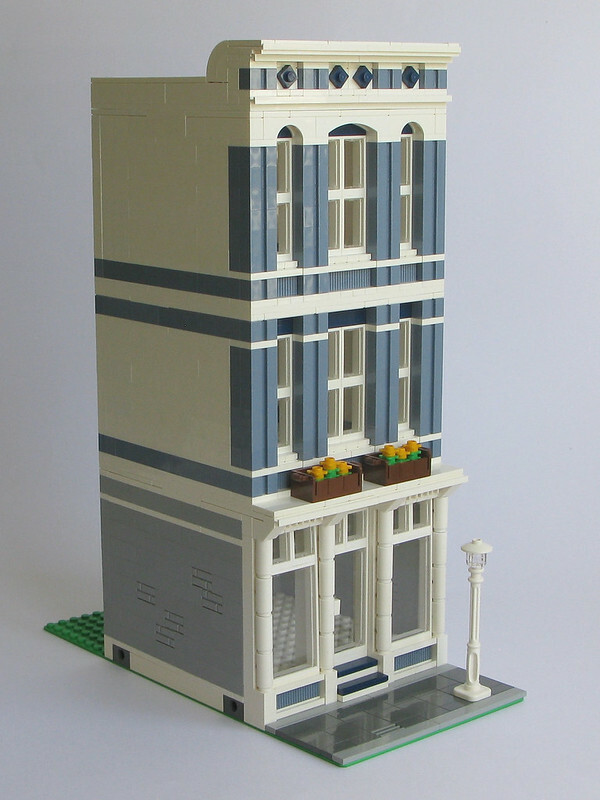 Head over to The Bear’s Eurobrick post for this building to see how the detail at the top of the second floor was done. tacvud has built this gorgeous modular building, called the tan house. As soon as I saw this building I thought of mocha torte. I think it’s the tans and browns, combined with the rich texture of this gorgeous building. There are quite a few details that caught my eye on this building, including the roof (love the black / brown combination), the use of the 1×2 log bricks to frame the front door and the beautiful SNOT work on the facade. For more inspiration, see tacvud’s other buildings here! esbenk (Esben Kolind) has created a vibrant scene depicting the brownstones of Brooklyn. It comprises 16 buildings, each with their own unique character, as well as a range of iconic New York vehicles. Head over to Esbenk’s flickr set to find out more about life in the Brooklyn Brownstones.